Though I am not at liberty to reveal everything I learned about the real “Best Little Whorehouse in Texas” while working toward my degree as a student at The University of Texas back in the early 1960’s, I can say that I have never seen a better production of the musical version than the one I saw off-Broadway somewhere in downtown Manhattan years ago. That was shortly before the show’s rapid rise in popularity brought it to a full Broadway production in 1978 at the 46th St. Theatre. There, it would run successfully for nearly four years. In my opinion, the star-vehicle film that followed (showcasing the pairing of Burt Reynolds and Dolly Parton) totally missed the charm of the original in bringing the story to the screen. 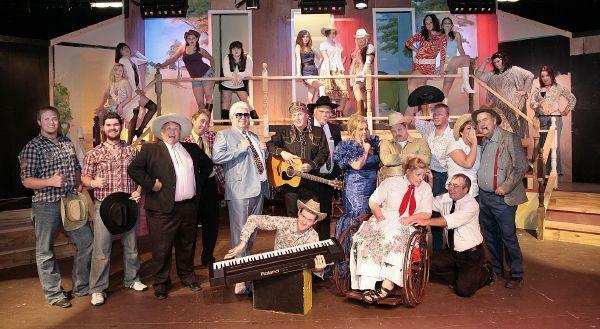 On the other hand, the current Crighton Players production, now playing at Conroe’s Owen Theatre, has done a very fine job of capturing the sweet innocence that one would not expect to find associated with a whorehouse. With a talented cast and sharp direction from Marty Craig, the familiar story of the show’s witty book (Larry L. King & Peter Masterson), tells the tale of a longstanding house of ill repute brought down by media spotlights and self-serving politicians. Here it comes to life with a perfect mixture of comedy and sentiment. Meanwhile, musical director, Caleb Ackerman, certainly does justice to the delightful music and lyrics of Carol Hall, while his orchestra, carefully sequestered beneath the stage, gives vibrant life to the score while never overwhelming the singers. The saucy costumes of designer, Lynn Peverill add to the fun, and the versatile, two-tiered set of designer, Wes Bush, is shown off well amid the lighting designs of Travis Bryant. I was a bit surprised that the song, “20 Fans,” was not complemented by any visible ceiling fans. Mr. Bryant, by the way, does plenty of scene stealing during the show in his role as the sometimes blustering, sometimes tender, Sheriff Ed Earl Dodd. His fits of anger are a riot, but may be taking a toll on his voice before his featured song, “Good Old Girl,” in Act II. Kerri Edwards’ sensitive performance as the madam gives us a warm Miss Mona, and anchors the show with singing that is consistently quite wonderful. Speaking of wonderful singing, Samantha Coombs in the role of Jewel was an absolute sensation singing, “Twenty-Four Hours of Lovin’.” She could have been on Broadway right then and there, and no one would have blinked an eye! It was a highlight of the show. Linda Holleman showed comic flair as the folksy, wise, restaurant waitress, Doatsey May, who sings poignantly of the lost opportunities in her life. The show pokes gentle fun at politicians well represented here by Steve Murphree (the senator), Joe Visor (the mayor), and Tom Leroy (the governor). Of course the featured character of Melvin P. Thorpe (sometimes known as Watchdog) is based on real life investigative reporter and TV newscaster, the late Marvin Zindler, who rose to fame crusading against the notorious “Chicken Ranch” in LaGrange, Texas. Jeffrey L. Baldwin portrays Thorpe here with uproarious fun, and his singing staff of Dogettes adds to the merriment. A lusty group of Aggie Boys provides a foot-stomping good time (choreographer, Kimberlee Childress), and the seductive “Miss Mona’s Girls” are ready and waiting when the lads arrive. Perhaps it is time for you to arrive at Conroe’s Owen Theatre for one of the remaining performances on Fridays and Saturdays at 8p.m. and Sunday’s at 2 p.m. through June 6th. For tickets and information call 936-539-4090 or visit the website at www.crightonplayers.org.